Last Thursday I went with a few people to the checkpoint near Akhalgori, a town that used to be part of Georgia and is now still occupied by the Russians. There’s been considerable disagreement about the wording of the treaty, with the phrase ‘retreating to pre-conflict positions’ causing the most trouble. So early Thursday morning I met with an American journalist, a half-English, half-Georgian guy, and Ben at Didube, and, letting the half-Georgian handle negotiations with a taxi, arranged to drive to the checkpoint. 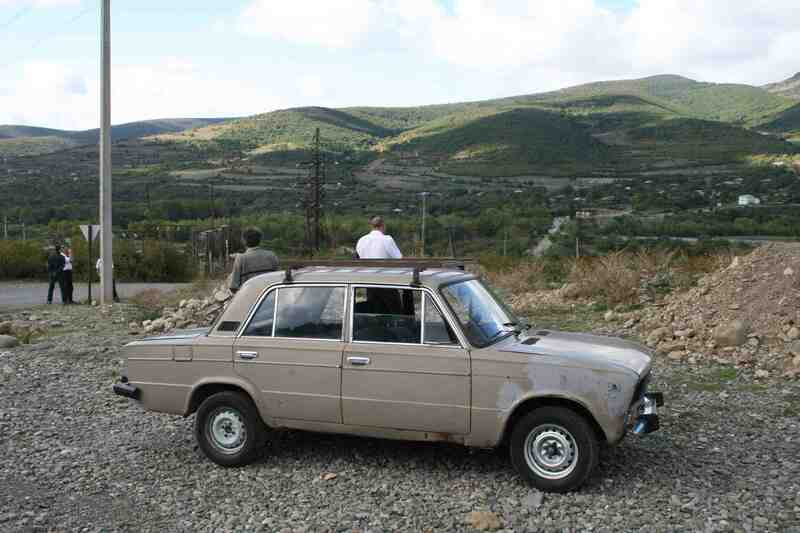 The car was an ancient, battered Lada that groaned on even mild inclines, the driver a garrulous middle-aged man who, after the fashion of most Georgians, would cross himself three times whenever we passed a church, and with particular energy as we passed the churches of Mtskheta, the town with Georgia’s oldest and most important churches. At the Georgian side of the checkpoint we got out and looked around; there were two EUMM Land Rovers by the side of the road, with half-a-dozen or so monitors conferring with one another and looking at the countryside through binoculars. They seemed to be either Swedish or English: a large, burly, square-jawed Swede who looked like Rolf Lundgren; a mild-mannered Englishman of perhaps 35; and a retired colonel, also English, who had been to numerous conflict zones and had even testified against Milosevic. 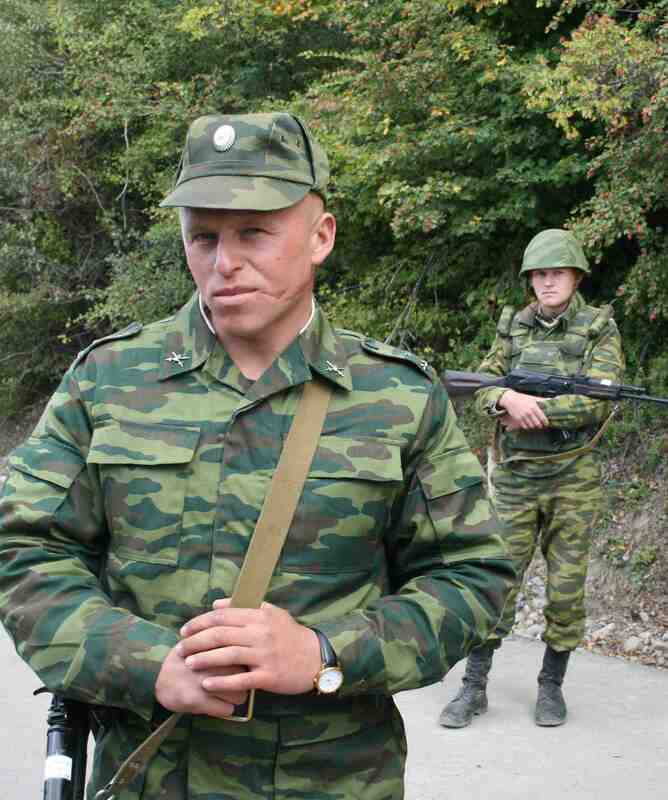 He told us about the Russian positions on the other side of the river that separated the province of Gori from South Ossetia, and how in villages just a few kilometers from the checkpoint people thought they were in Russia. On the other side of the valley two or three Russian camps were visible, one or two large trucks, lines of sandbags, and the odd soldier milling about. The retired colonel said that they’d recently spotted a tank in the area, and he was now trying to locate it. 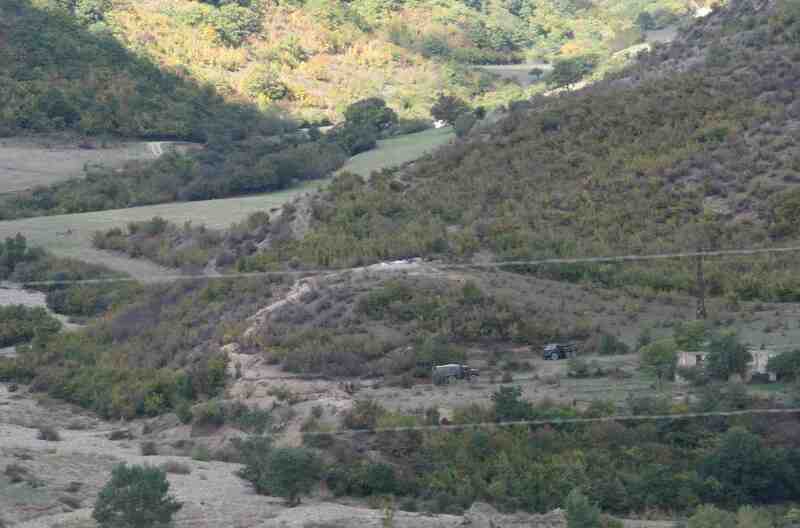 Apparently that area had always been part of South Ossetia, and wasn’t disputed, even by the Georgians; but the digging in by Russian troops had only started the past two or three days. 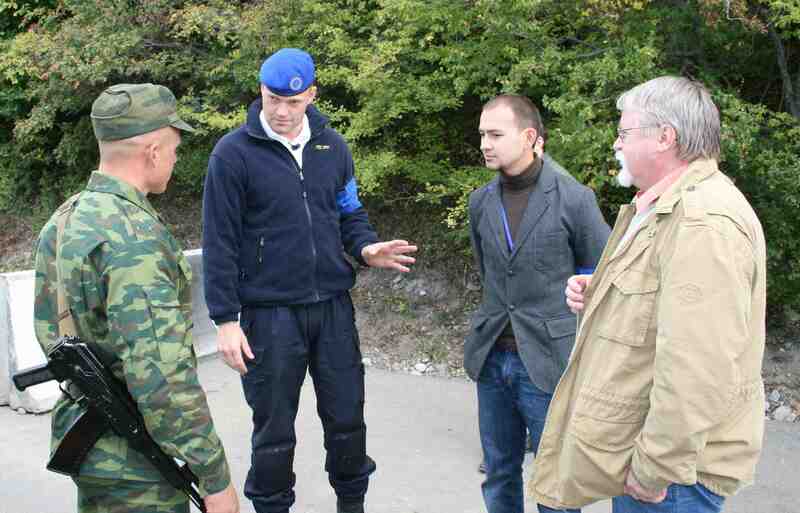 After talking to the monitors, we made our way down to the Russian side of the checkpoint, arriving before the EUMM jeeps. Only three soldiers stood by the concrete blocks that formed the checkpoint, though others were visible behind sandbags ten meters behind, and one or two more farther down the road. 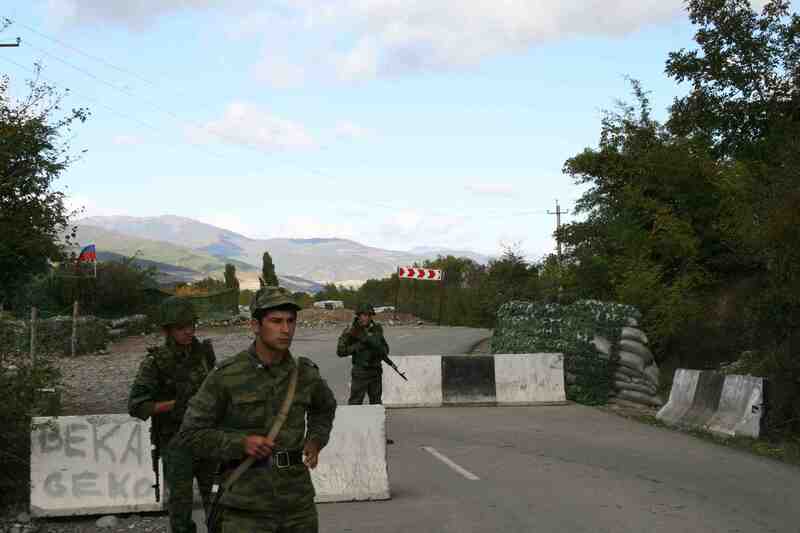 There were all quite young: the man who appeared to be in control of everything, that checkpoint as well as the other one across the river from the Georgian checkpoint, was only 25, and the others were between 22 and 24. We talked about the conflict, and their positions in the area, and asked whether they knew how long they would stay in South Ossetia. Boris, the Senior Lieutenant in charge of the checkpoint, didn’t reveal much, though he was friendly enough. In a few minutes the EUMM people arrived, a jeep with Swedish television journalists following behind them. The Swede spoke to Boris through a translator, asking about the Russian positions and whether they had any orders for the next few days. It was all quite formal, and seemed more an exercise in letting the Russians know the EU monitors were around than actually gathering any kind of useful information. After fifteen minutes they departed, and we stayed a short while longer, chatting more personally with the guards. Boris was from Siberia, and had served in the army four years; wasn’t married, and did mention that living conditions for the Russian soldiers were pretty poor—they lived in tents, pay wasn’t very good, and morale was often low. Someone asked him about the frequency of suicide in the army, as reported by the western press, to which he shrugged and said he didn’t know much about that. Before we left a toast was proposed—naturally—and a bottle of chacha appeared from somewhere together with half-a-dozen plastic cups. Boris wouldn’t join the others, but the Georgians continued with a toast to peace, downed the chacha, and we gradually made our way back to the Georgian side of the checkpoint.